This review is from one of our riding partners, Tim “Scissor Hands” Shears. Scissor Hands has an inquiring mind matched to a good wit. His thoughts on Crank Brother’s Cobalt cranks and his experience with Crank Brothers are helpful for those considering a new set of nice cranks for their rig. I know what you’re thinking: a crank set review, what is there to review? Well, let me tell you there is definitely something to talk about here. 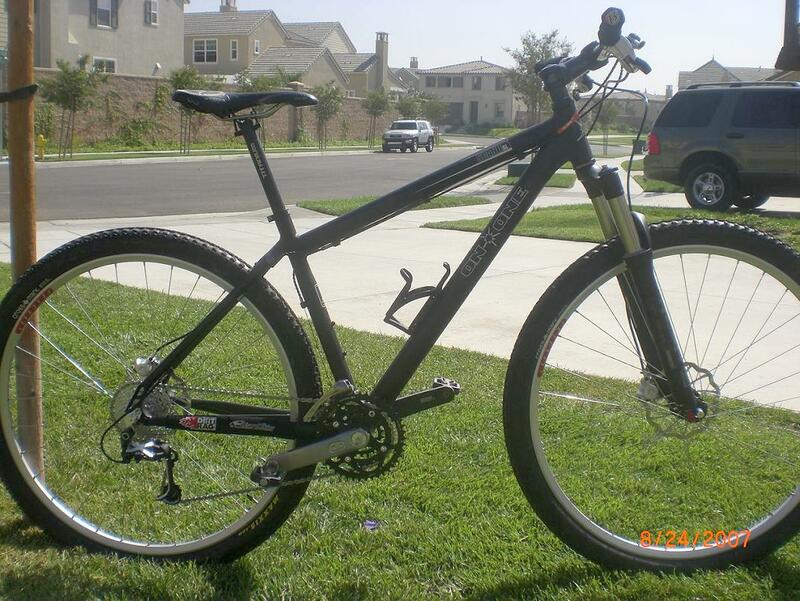 Some time ago I scored a sweet deal on a new Crank Brothers Cobalt Chromoly crankset on Ebay. It was destined for a 29er build project I was planning. Isolating this review on the crankset only, without considering the bike as a whole, was a bit of a challenge but after many sleepless nights and a whole lot of caffeine I came up with a few thoughts that I’d like to share. First of all I am a xc rider, amateur racer (two races under my belt now!) and die hard weekend warrior. I weigh about 170 geared up and stand about 5’10�?. I always try to shift at the most opportune time by always trying to keep my eyes up and preparing ahead of time for hills and descents or whatever is coming up on the trail. In my experience this is the smoothest way to ride not to mention the easiest on the drivetrain. Needless to say I always tried to ride my rigs as efficiently as possible without any purposeful abuse. Out of the box, you notice right away that this is no ordinary crankset. It is gorgeous and well thought out. A lot of planning went into the design and appearance of these parts. Maybe it’s due to the design, but I find that my heels never seem to rub on the arms of this crankset. I know you’ve seen those used cranks on Ebay with all the scrapes and scratches that seriously diminish that appearance. On the Cobalt, my feet seem to ride pretty parallel so no scratches for me. The BB is so nicely designed that I wouldn’t mind putting it on the wall, throw a frame around and pointing it out as cousin “BB�?. Why don’t we have transparent BB shells? Someone seriously has to invent this. So the installation was pretty straightforward, make sure everything is clean, greased and torqued to the proper specs. This setup is an ISIS only design. I had previously read some pretty negative comments about ISIS drive setups but decided to take my chance anyway. Crank Brothers has a ridiculous 5 year warranty on the Crankset and BB. I actually got to take advantage of this offer as for some reason I could never get the crank bolts to stay tight. It got to the point that not even blue Loctite could keep the non-drive side to stay torqued. One e-mail to Crank Brothers and off went my set up via USPS. A few days later I had a brand new setup on my porch with a surprising upgrade, a titanium BB. From the quick response and the upgrade, I can confidently say that Cranks Brothers does know how to take care of its customers. Riding these cranks presented no problems with stiffness or flex. I’m not a big guy so maybe those with a little more girth would beg to differ. I’ve read that Crank Brothers came up with the idea for these cranks by playing with a shoe box and what they noticed about the stiffness of the overall structure dramatically increasing when the lid was on compared to when it was off; don’t quote me on this but either way I had no issues in this department. One thing I noticed was that my feet, while riding, were now a little closer together than when I rode my other bike set up with a Race Face Evolve Crankset. Apparently this is known as the Q-Factor. Where the “Q�? came from I don’t know, but what I found out was that I actually preferred my feet in this new found position. It’s probably a personal thing that everyone has to discover for themselves, but I found it to be more comfortable on longer rides. Overall this Crankset and BB were a great addition to my build. After some initial adjustments and a quick e-mail to Crank Brothers I am a happy camper and feel as though I made the right decision with my hard earned money. Quality shifting was always present (with proper front derailleur adjustment of course) and after the BB bearings were broken in this crankset would spin very freely. I paired this Crankset with an xt cassette and a KMC 10 speed chain (the weight weenie in me made me do it) and it never missed a beat. I never got around to actually weighing the parts on a proper scale to see if they weigh as much as advertised but the good ol’ hand hold test revealed that they were definitely light enough for me. My build ended up being 22.3lbs which made me very happy. If you want a great crankset backed by a company with excellent customer service and a warranty no one else is offering, than this is the one for you. Click here for Crank Brothers website. 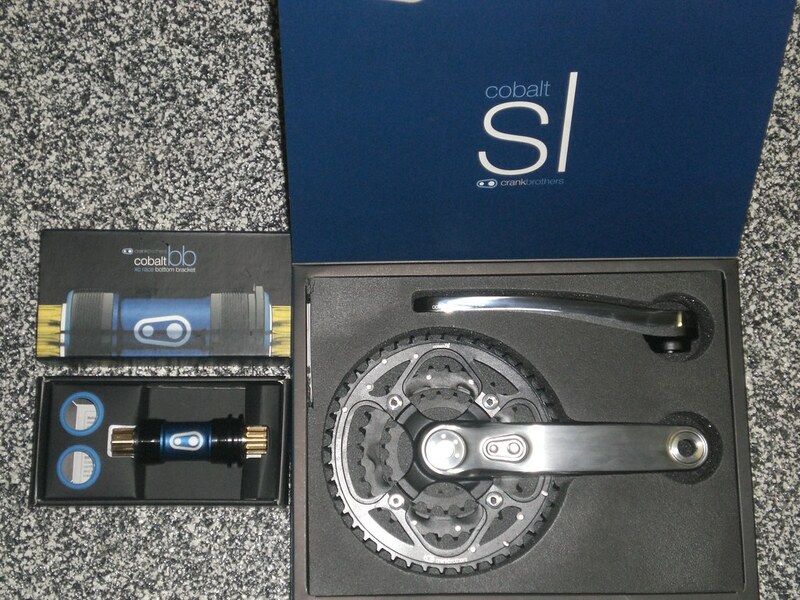 I have Cobalt cranks on both of my bikes. For me, it’s all about the narrower q-factor. I’ve tried cranks with similar dimensions (RaceFace Deus XC), but even though they were only 1-2mm wider, my shoes would “catch” on the arms. Crank Bros’ warranty is top notch. I noticed that the spider/chainrings on one of my cranks had a “wobble,” so I e-mailed CB, who told me to send them back. On the same day they received my cranks, a new set was shipped out. THAT’S service! While the Crank Bros cranks look great on the bike…I still can’t jump on the ISIS bottom bracket. The bearings just don’t hold up like square tapers. I would have really liked to see a x-type BB. I had the same concerns as you did Robb. I originally had a Token BB (that was very beautiful btw!) and it didn’t even last 9 months. The Crank Brothers BB has a 5 year warranty, so you can’t go wrong there. It also has a cool little blue seal for added protection that I would reccomend putting a small amount of glue on. Mark, I agree, the narrower Q factor was a definete plus for me as well. I suspect the reason the arms don’t show scratches and shoe rub is that they’re faced with stainless steel, a MUCH harder material than the traditional forged or CNC’d aluminum crankarms. I also wonder about choosing ISIS for a BB standard. Weird. Crank Brothers has some of the most awesome packaging I have ever seen. I have their egg beater pedals on both my bikes. They are works of art and perform very well. What happened? These cranks appear to be no longer on the market. You’re right, Bravo. To my knowledge, they are no longer on the market. You can occasionally find them used, though.